A 2009 paper¹ plots GISP2 paleoclimate icecore data from central Greenland over the past 8000 years, finding at least 6 periods of warming exceeding that of the 20th century. 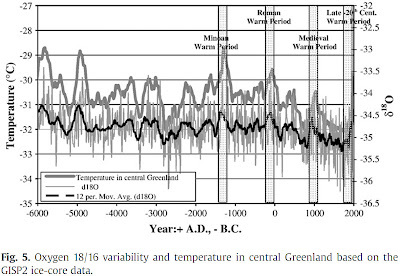 In addition, the rate of warming 900-1000 AD leading up to the Medieval Warming Period exceeds the rate of warming in the 20th century. The authors find close agreement between two analysis methods of the temperature proxies for GISP2 data, stable isotope analysis² and Oxygen 18/16 variability³. 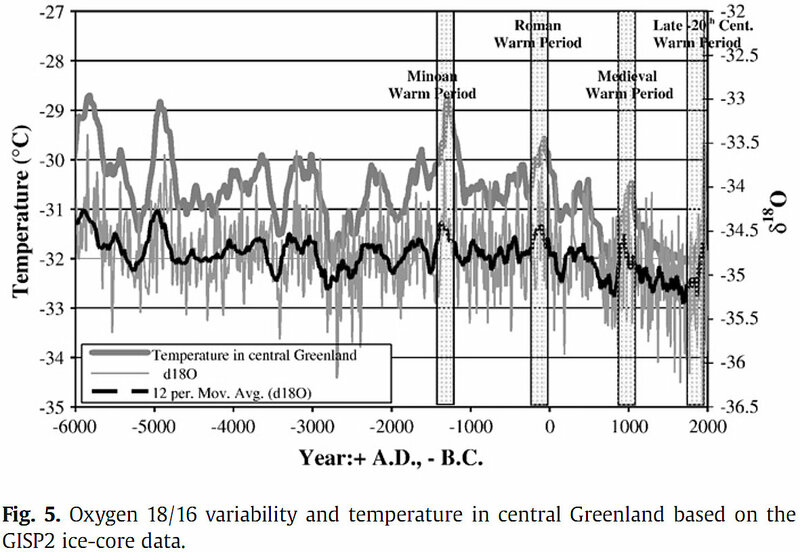 The Medieval, Roman, and Minoan warming periods are all found to be hotter than the 20th century, in addition to other unnamed periods of warming over the past 8000 years. ¹Florides GA, Christodoulides P Global warming and CO2 through sciences. Environ Int. 2009 Feb;35(2):390-401. Graph showing Greenland glacier retreat shows that the retreat from 1929-1953 (24 years) was faster than from 1953-2003 (50 years). Can anyone link to the actual article without paying. Not everyone can afford the cost of the article or have access at a library for a study copy. It is an interesting article and I will be posting summaries of the best parts on this blog while avoiding copyright restrictions. Unfortunately, I don't know of any free links to the article. Your FTP link is broken.